Somewhere in the Twilight Zone there’s a mystic carnival you can enter, a hazy surrealistic world where things aren’t quite what they seem. Maybe in this realm it’s people who are confined in cages as animals walk around free, gawking at the curious looking humans scratching and grooming themselves in their pens while warning their cubs “Don’t get too close to the bars!”. It could be that the rides in this carnival aren’t the kind that bring you safely back where you began, but rather might send you off to another dimension altogether… as if that uncertainty was all part of the fun. The games at each booth that you step up to play are a little odd as well, offering you the chance to throw milk bottles at baseballs to win a prize rather than the other way around. It’s certainly not the type of place you’re used to that’s for sure, but as intriguing as all of this is you’re still a little bit skeptical and chances are you’ll lose interest before you’ve been fully hooked by their pitch. Maybe your girlfriend is tugging on your sleeve to walk further down to buy some cotton candy… made from real cotton in this strange place… but the voice of that soothsayer rings in your ears. Beyond him, through the flaps in the tent, you hear something else beckoning to you from out of the misty past. Yesterday’s music. Music you’d somehow forgotten about but now that you hear it again it seems strangely familiar… comforting… reassuring. If so, congratulations, you’ve just been suckered into buying the latest release from Big Joe Turner on MGM Records. Those damn carny hucksters, they got you again! 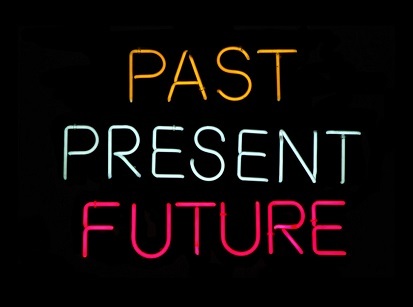 There are three points in time – past, present and future – each one distinctive yet intrinsically connected. By nature they have elastic boundaries, rapidly shifting their definitions as time inches forward. Tomorrow is still the future of course, yet in just twenty four hours it will be the present and twenty four hours beyond that it’ll be the past. I know, revelatory stuff, isn’t it? But you can expand the parameters of the terms too. The present can refer to a week, a month, even the current year if you so choose. A record for instance that comes out this month isn’t suddenly deemed to be music from the past once next month arrives, it’s still reasonably referred to as belonging to the present, as “current music”. Yet a few years from now it’ll be reclassified as the next sounds to come along pushes it further into the past. But when does that happen? Is there an expiration date to music? A date on a calendar that gets flipped to determine what is slotted in which compartment? Well, maybe the best way to put it is this: When the music appeals most strongly to the current generation who are most interested in using that music to define their lives in some way, then that music is fresh, vibrant and current in every way. It’s music of the present. But when those same listeners have moved on to other pursuits, another stage of their lives where music no longer has the same cultural pull for them and their generation, then that music belongs to another time, it has receded into the past. Whether a year ago or a decade ago, once it no longer shapes the trends and provides the soundtrack to the lives of the most fervent brand of listener it becomes yesterday’s music. 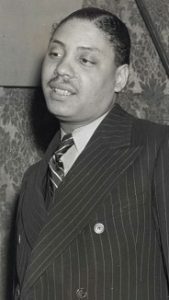 By all rights Joe Turner belonged to yesterday by the summer of 1949. He was 38 years old now, singing professionally in one form or another since his mid-teens when he provided entertainment while working speakeasies during prohibition. He’d launched his career in the proper sense at the From Spirituals To Swing concert held at New York’s Carnegie Hall back in December 1938, at this stage more than a decade in the rearview mirror. To show you how long ago that was in perception just look at the two musical terms used in the title of the show, as neither “spirituals” nor “swing” were still being widely used in the vernacular of the modern day young music fan of 1949. 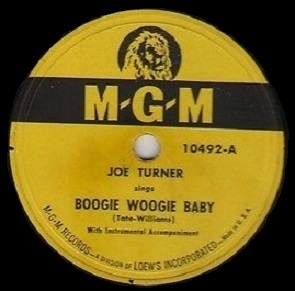 Turner certainly had a good run alongside his erstwhile partner Pete Johnson, as the two of them had defined the boogie woogie craze which swept the nation in the years immediately following that, but when tastes changed their fortunes fell. They were both still well respected, still had plenty of opportunities to find work, be it for live gigs or recording, but neither of them were poised to define yet another era or style of music. Their time had seemingly come and gone and now they were relics from the past. A recent past maybe, but still belonging to yesterday no matter how you looked at it. But as this was taking place a new brand of music was emerging that was built from the discarded remains of their earlier triumphs. Rock ‘n’ roll had come into being in 1947 and two years later was already the dominant form of black music in America. It had its own stars of course, younger singers and instrumentalists who’d come of age much more recently than Turner had, and who were now busily creating music for this generation. There may have been a few holdovers from the preceding years who contributed to it and provided some sort of tenuous bridge to the past but the music that was defining the present and shaping the future was far removed from that which had made up Turner’s heyday. Thus it was probably inevitable that record companies who called Joe Turner to come in a cut a few sides were going to be focused on appealing to those who knew him from way back when. The musical approach they requested of him would be shaped by the sounds of yesterday and for the most part the makeup of the band, their arrangements, the material itself and the marketing for the finished products would all suggest songs like Boogie Woogie Baby was music meant for those who were no longer up to date on the latest sounds and thus no longer quite as relevant as they’d been just a few years earlier. It seems the only one who wasn’t quite comfortable in ceding to this generational mindset that resolutely stuck him in the past was Big Joe Turner himself. One of the things we have to face no matter how insistent we are that he was yearning to join in the fun on the emerging rock ‘n’ roll playground is that all of Joe Turner’s material, or at least the self-penned sides, was already quite old. He was among the last of a dying breed of singer who’d have a solid framework of melodies and themes and constantly use them… and re-use them… to build new songs, almost ad-libbing verses that fit the structure on demand, their components so sturdy that you’d insist the compositions themselves were etched in stone rather than drawn in wet sand. So chances are if you’ve got a Joe Turner collection in your music library, no matter what tracks it contains, then you’ve heard him singing these sentiments. It might be under a different title, certainly different accompaniment, different tempo, different mood, but same general song. That’s hardly a criticism because if there was one thing Turner excelled at it was re-shaping these songs for whatever purpose was asked of him. On THIS rendition, though a little too far out of the loop for our tastes as committed rock enthusiasts, he delivers it with his usual skill and class. The jist of the story to Boogie Woogie Baby is that finds himself smitten with a girl who “sets my soul on fire” (and his pronunciation of fire as “Fahr” will surely bring a smile to your face) and despite her seeming to come up short in some of the social benchmarks he values, he couldn’t care less because of how she can boogie. Now I’m sure he’s referring to dancing, or at least he is when reassuring the censors at the record company, but we know better. Right before that in fact he tells us she can’t do the Suzy-Q, itself a dance from the mid-1930’s just to show you how long these verses have been gathering dust, so we’re pretty sure that it’s not her ability to master different steps on the dance floor that form the basis of these lines. When Joe says boogie, he means between the sheets… and if he doesn’t, well, he SHOULD! He especially should because of who his delivery is geared towards appealing to, namely the rock fans who could care less about the Lindy Hop techniques he obliquely refers to. For past generations maybe dancing was the real workout of a night on the town, but now it’s only to limber you up for an even more exhausting nightcap back in the privacy of your bedroom. Turner’s vocals reveal the subtext that the lyrics merely hint at, his voice roaring with excitement at times, his horniness clearly evident in some of the lines, and anything he doesn’t convey vocally Pete Johnson more than makes up for it with his piano pounding workout in the extended break. The two of them are the show here, forming the edge of your seat rock attack, or at least something as close to it as they’re allowed to offer on a record that otherwise wants no part of any aspect of present day black musical motifs… which not coincidentally is where the plaudits for this performance abruptly end. We don’t have to look far to find out the guilty parties in this stylistic blast from the past. The horn section may be filled with big names with long résumés, including Maxwell Davis who ranks as high as anyone in history as a rock producer and sideman of renown, but unfortunately nothing he or the others play on this track would convince you they were even aware such a thing as rock ‘n’ roll existed yet. Their playing is so archaic, not only in the patterns they’re offering up but also in the higher bleating tones they’re using in the process, that hearing it you feel as if you DID in fact step into that otherworldly carnival tent and went hurtling back in time five or six years at the very least. If someone asked you how the war was going while listening to this, or were oblivious to the soaring popularity of a recent contraption called television you probably wouldn’t be surprised, that’s how hopelessly out of touch the horns are. It’s a sound so incompatible with the present musical and cultural attitudes of the cutting edge audience of 1949 that no matter how much effort Turner was putting forth to try and convince listeners not to blame him for the shortcomings of his cohorts this generation of fans were almost certainly going to turn their backs on him all the same. The entire concept of this becomes instantly dated as soon as the horns make their onerous presence known and since they carry such a heavy load in the arrangement Turner can’t very well avoid having them drag him down with them, no matter how nimble footed he is in carrying off his own part in this ordeal. What’s amazing though, admirable even in a perverse way, is that for once Turner manages to prevent them from clashing outright. He seems to understand their perspective and rather than try and slug it out with them, or just throw in the towel and walk out on them all, he adheres to the basic concept they’re using and then simply tries his damnedest to pull them along with him as if through his yeoman effort alone he could get them to sound more up to date. It doesn’t turn out that way of course, he’s only human after all, not a superhero and as a result Boogie Woogie Baby comes off as outdated and woefully out of step with the rock field he’s been flirting with on and off for months now. Yet to be fair if you were re-label this as having been issued in 1945 let’s say, your appreciation of it would probably go up quite a bit. So yes, in a different musical and cultural context it works well enough, but unfortunately for him we’re not IN that context anymore in mid-1949 and so this becomes just another missed opportunity for Turner to make some much needed headway to keep his career on the right path to lead him back to glory. Time moves on after all and thus far he hasn’t moved with it, his present output being more suited for the past which renders his tomorrows uncertain. By the end of the night at this crazy musical carnival the Ferris wheel ride has shut down, the colored lights are blinking on and off as the hot dog wrappers and crushed popcorn boxes litter the fairgrounds. Off in the distance, sitting on an overturned crate next to the Hall Of Mirrors is a hulking forlorn figure hunched over and mumbling to himself. When he finally looks up we see Joe’s face, a blank incredulous expression reflected in the moonlight as he sighs in despair. Eventually he gets to his feet and returns wearily to his cage as the music executives lock the doors for the night where he’ll drift off to a restless sleep until morning. After dawn breaks the zookeepers in this backwards Twilight Zone universe will open the carnival gates, sell more tickets and let in another steady stream of animals to stare at Turner through the bars in wide-eyed wonder. A captive waiting to be sprung. Leave a reply on "Big Joe Turner: “Boogie Woogie Baby”"